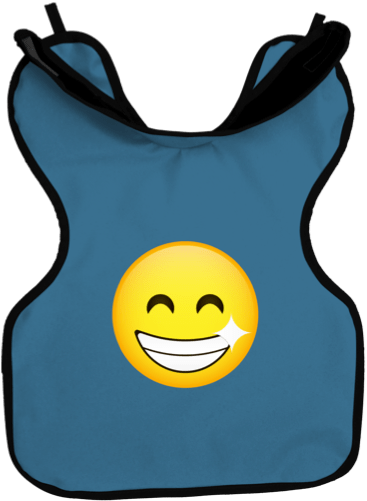 After 30 years of bringing smiles to patients, Palmero Healthcare’s Happy Face design that’s synonymous with Palmero’s Cling Shield® X-ray apron brand, is getting a companion. Rather than pick from a pre-existing design, Palmero decided to let the public find the new face of the company. The contest drew designers from around the world. Palmero received more than 75 submissions. The winner, who received a cash prize for his efforts, and his design will now be known as the ‘Smiley’. It will be available this summer on select Palmero’s Cling Shield child X-ray apron styles. The new Smiley aprons will come in three unique styles. It will feature medical-grade textured vinyl Cling Shield® backing that clings in place ensuring coverage by preventing slippage and providing stability and high-density lead along with Palmero’s Lead-Free materials to effectively shield the patient from radiation. They will be available in Child Protectall Apron with Neck Collar; Child Apron, No Collar; Child Pano Dual Apron, No Collar. For more information, visit palmerohealth.com, email customerservice@palmerohealth.com or call 800-344-6424.